Here's the whole village. I really like the houses with the plain windows better! Can't wait to see them with the tiny sashing and cornerstone blocks. That's a long long ways away from now. Check out this week's giveaway at KoolBeenz. You could win a $25 credit to The Quilted Castle! Here's another block to add to my monochromatic color scheme blocks. 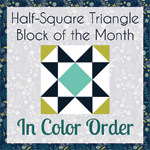 It's the January block from Jenni at the In Color Order blog. http://incolororder.blogspot.com/2012/01/hst-block-of-month-january.html She is doing a block of the month with each block using half square triangles. I really like the colors I picked for this one. Win a Bali Pop! Giveaway ends February 3, 2012. Check it out! 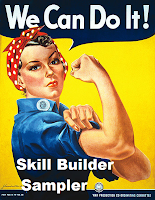 The last block in the curved skill builder is Block #24, Curved 9-Patch. I thought this block was easy! The points came out really nice, and it's flat as a pancake. Here are my three We Can Do It Skill Builder Sampler blocks plus one bonus circle block for this segment. Lily Pad Quilting: Got thread? 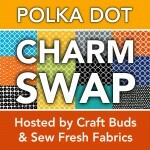 (A Giveaway): Yes, that's right, a giveaway over at Lily Pad Quilting! There will be two winners. Each will get three charm packs and some Superior Thread. Check it out! Here's the block I made for January's Block Swap Adventure. It is for Susan in MD. Susan likes 9-patch blocks, so I made her the 9-Patch Variation from Quilter's Cache. 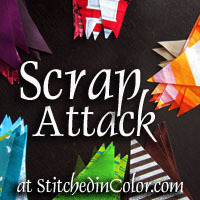 Here's the links to the scrap bustin' blogs! Hurry! There may be a spot or two left! Here's my seven little houses for the week. I LOVE these Civil War Crossing by Moda scraps in the top six houses! Remember, these are only 3.5" square. Here are four eclipse blocks for the January Block Lotto. Five more to go. I love these blocks. They are fun! Soooooo happy I have learned how to do curves. This gives me a lot more options. I like this picture, but my photography really needs some help! I like the way the sun is shining through the quilt... but I don't know how to flip it right-side up. Here's another... It was just hard to find a little sun here in Ohio in my usual spots. It also goes hand in hand with the Scrap Attach QA. 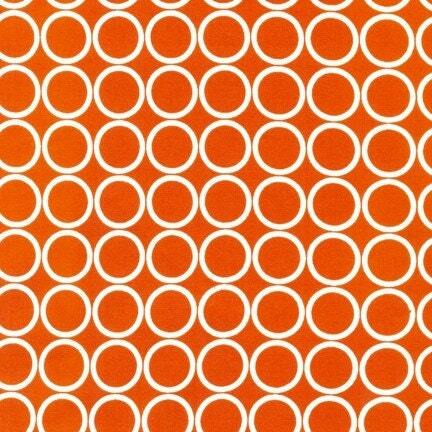 I'm telling you... 2012 is the year for FMQ and busting my scraps. I got all 18 of the snowball blocks done, half of the flying geese done, and all of the pieces cut. (Many of the pieces were already cut and leftovers from my Orca Bay Mystery Quilt.) Hopefully I'll get back to piecing Orca Bay as early as Tuesday next week. X's & O's Baby Quilt Finish! Woot woot! Another 2012 finish! It almost looks like I got my inspriration colors from the snowy background. I'm so happy how this finished. It will be my charity quilt for our local guild. I used a jean needle instead of a quilting needle for FMQ. I only broke one needle total quilt! times I think you can get it for $1. Really? $2 thread in a huge cone? It comes in tons of colors. I'd also like to thank Judy at Patchwork Times for having a UFO challege for 2012. I'm in it. This is right up my ally for my 2012 goal. http://www.patchworktimes.com/2012-ufo-challenge/ This month's challenge was to work on #5 on the list which was this X's & O's baby quilt. (You can see my other picks for the year on the tab on the top of my blog.) It was so much fun having a finish that I may start working on one of the others right away... Or start somthing else new now that I have an empty bin from this quilt. Check out the blog "My Sister Made Me Do It". There's a One-Month-Before-My-Blogiversary giveaway there. You could win an assortment of nice quilty things -- including six fat quarters from Connecting Threads. This giveaway ends on 1/27/12. Check out the birthday giveaway at http://keepsakesbymelissa.blogspot.com/2012/01/my-birthday-giveaway.html One of the prizes is $140 in gift cards at Michaels! ...just sayin'. This giveaway ends 2/1/12. Here's the cute block I received this week from Susan in MD. LOVE the yellow and orange!!! Now I only need one more block (#22 Flowering Snowball) to get all caught up with this QA! Whohoo! Today I started a new little quilt along with Faith at http://www.freshlemonsquilts.com/?p=1550 These blocks will be perfect to add to the ones I did with the Summer Sampler Series! Here's today's block. It's called Ribbon Star. Doesn't it go great with my others just waiting on more friends? This UFO is back on the radar! I completed this little quilt. Hopefully it's big enough for our local quilt guild's charity. Over at Jo's Country Junction we are also linking up with Waste Not Wednesdays. I am going to make Jo's crockpot recipe for scalloped potatoes and ham tomorrow in my crockpot! Here's my info about onions. I no longer put onions in a baggie and save them for something the next day. Use them or lose them! Don't know how much of this is fact but it's interesting reading! Makes you wonder how much is true!! In 1919 when the flu killed 40 million people there was this Doctor whovisited many farmers to see if he could help them combat the flu. Many of the farmers and their families had contracted the flu and many had died. The doctor came upon this one farmer and, to his surprise, all were very healthy. When the doctor asked the farmer what he was doing that was different, the wife replied she placed an unpeeled onion in a dish in the rooms of the home, (probably only two rooms back then). The doctor couldn't believe what he heard. He asked the farmer if he could have one of the onions to place under the microscope. The farmer’s wife gave him an onion and when he placed it under the microscope, he did find the flu virus in the onion. It obviously had absorbed the bacteria, therefore, keeping the family healthy. Now, I heard the following story from my hairdresser. She said several years ago, many of her employees were coming down with the flu, and also many of her customers. The next year she placed several bowls, containing onions, around in her shop. To her surprise, none of her staff got sick. It must work. Try it and see what happens. We did it last year and we never took the flu. Many times when we have stomach problems we don't know what to blame. Maybe it's the onions that are to blame. The reason onions are so good at preventing us from getting colds, and flu, is that onions absorb bacteria. This is also the reason we should not eat an onion that has sat for a time after it’s been cut open. I had the wonderful privilege of touring Mullins Food Products, makers of mayonnaise. Questions about food poisoning came up, and I wanted to share what I learned from a chemist. Ed, who was our tour guide, is a food chemistry whiz. During the tour, someone asked if we really needed to worry about mayonnaise. People are always worried that mayonnaise will spoil. Ed's answer will surprise you. Ed said all commercially made mayo is completely safe. "It doesn't have to be refrigerated. Although there’s no harm in refrigerating it, but it's not really necessary." He explained the pH in mayonnaise is set at a point that bacteria could not survive in that environment. He then talked about the summer picnic with the bowl of potato salad sitting on the table, and how everyone blames the mayonnaise when someone gets sick. Ed says when food poisoning is reported; the first thing the officials look for is when the 'victim' last ate ONIONS and where those onions came from (in the potato salad?). Ed says it's not the mayonnaise (as long as it's not homemade mayo) that spoils in the outdoors. It's probably the ONIONS, and if not the onions, it's the POTATOES. put on your hotdogs at the baseball park!). Ed says if you take the leftover onion and cook it like crazy you'll probably be okay, but if you slice that leftover onion and put on your sandwich, you're asking for trouble. In a potato salad both the onions, and the moist potato, will attract and grow bacteria faster than any commercial mayonnaise will. Also, dogs should never eat onions. Their stomachs cannot metabolize onions. Please remember: it is dangerous to cut an onion and plan to cook it the next day. The onion becomes highly poisonous, even after a single night, and creates toxic bacteria. These bacteria may cause adverse stomach infections because of excess bile secretions and even food poisoning. Just like that! The onion was a mess and I began to feel better. Completed Projects -- 13 -- whohoo!!!! 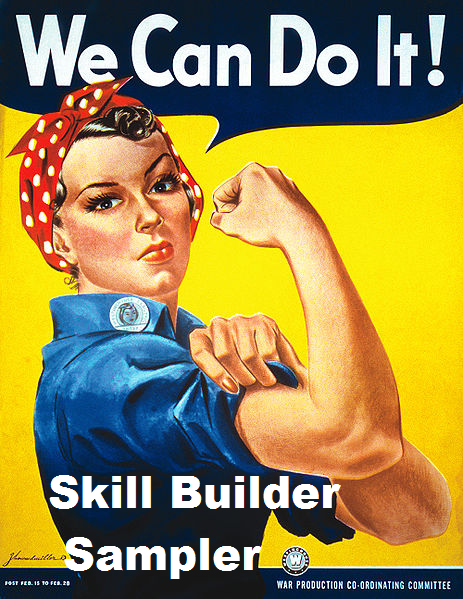 We Can Do It Skill Builder Blocks 21, 22, & 23!! !